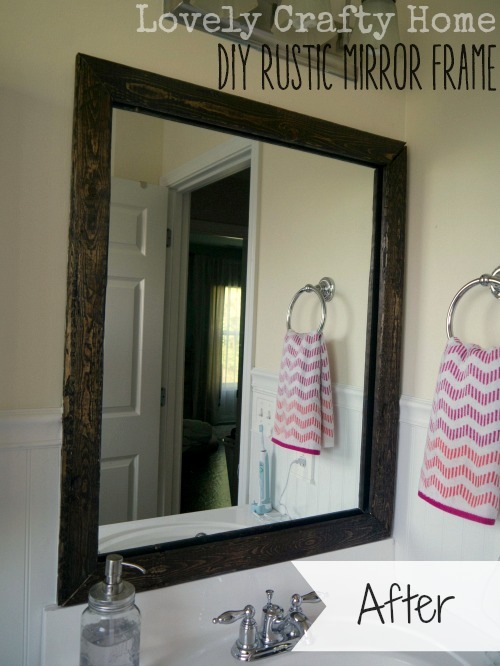 Waaaaaay back in the beginning of my blogging days, I did this simple project to my boring contractor mirror using a product called MirrEdge. 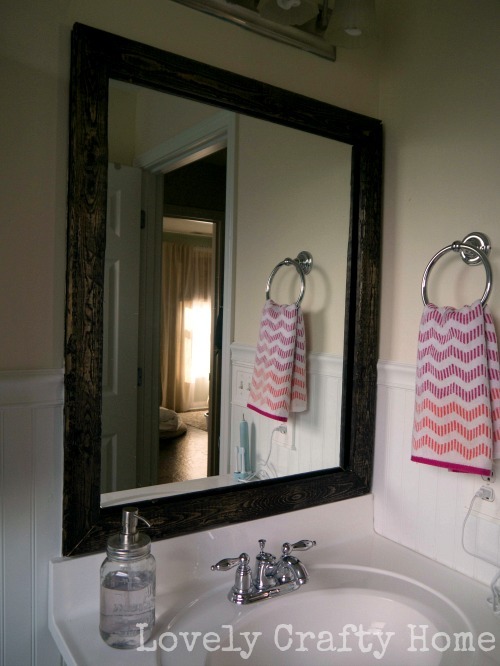 It was a great solution at the time, but I have grown tired of the look over the past couple of years – especially since doing other updates in that space (like adding beadboard and painting the vanity). 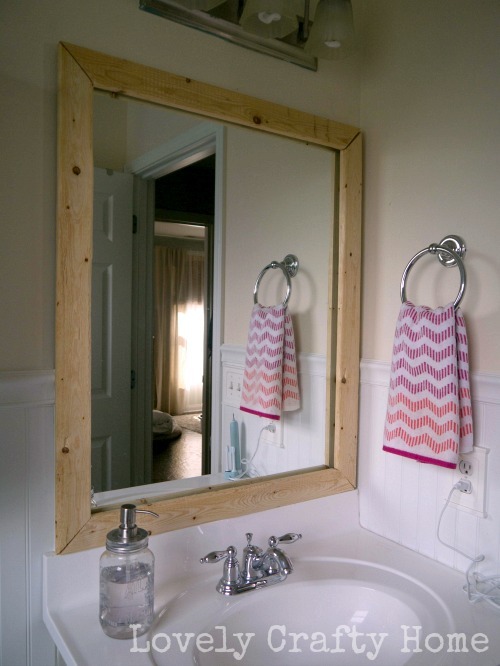 I wanted to make a real wood frame, something rustic that popped against the white beadboard. I had my husband whip up a frame out of cheap-o 1×3 white wood. I would have done it myself, but the wood was a little tougher to cut with my miter box so he got out the big saw. 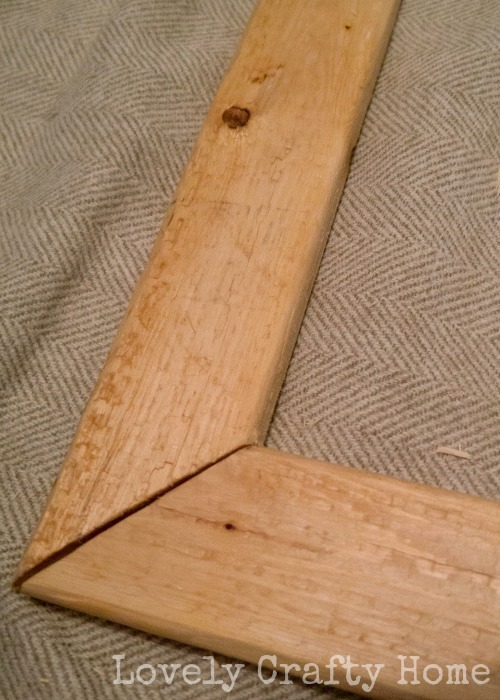 The frame is held together by some simple flat brackets. My plan was to stain and white wash the frame to get a weathered look, so I purposefully picked pieces of wood that were not perfect. 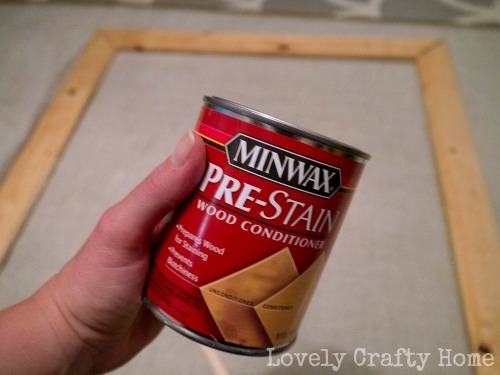 Nevertheless, I did sand (no one wants a splinter while windex-ing) the whole frame before applying wood conditioner. This just helps stain go on more evenly. It gives the raw wood a bit of a deeper color. Once that set in, I went ahead and got out the Command Strips to mount it on the mirror. See, the old frame was literally glued and sticker-ed on – and while it wasn’t terrible to remove, I really did not want to make this mess worse! I applied 4 sets of Command strips to the corner areas of the mirror. 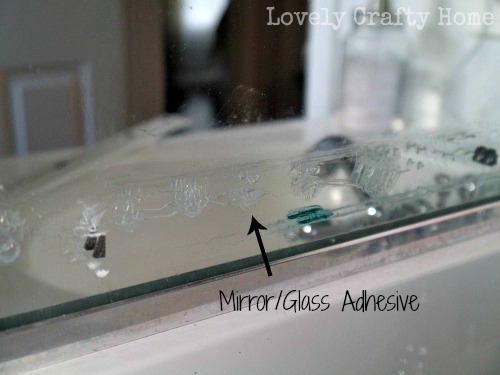 I wanted to put them on the mirror first to be sure to avoid old adhesive. Notice I applied the Command Strips on the silver “lip” of the mirror, which wasn’t previously covered by the old frame – that was on purpose as I always hated the fact that I left that to stick out at the bottom! Then I removed the paper backing on the strips and held up the mirror where I wanted, making sure to press the areas with the strips for the 30 seconds recommended on the package. Um, is it just me or is this like a mega improvement already? 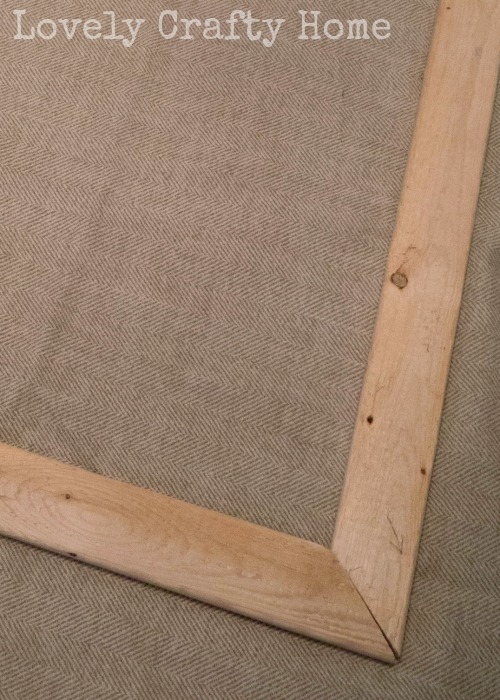 But I did want to give it a darker/pallet-y finish, so I took the frame down (bonus of the Command velcro-like strips!) and applied Old Masters Spanish Oak wiping stain all over. Then of course I put it back up to see how it looked and let it dry. 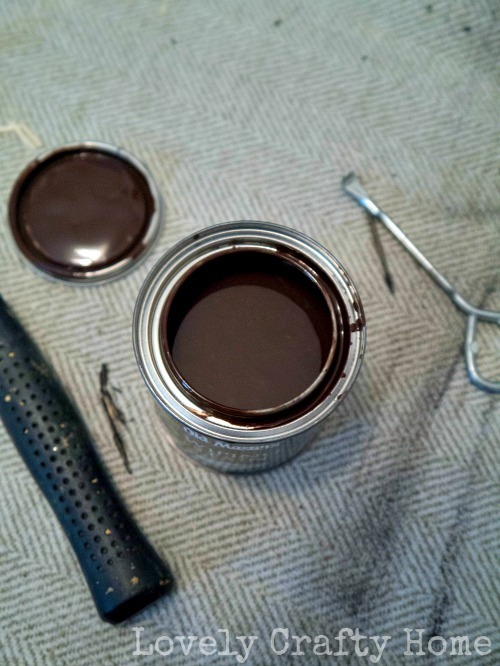 The next step was to warm it up a bit, so I applied Old Masters Dark Mahogany. The difference is subtle, I wiped on very little just to add a bit of warmth to prep for the final step! 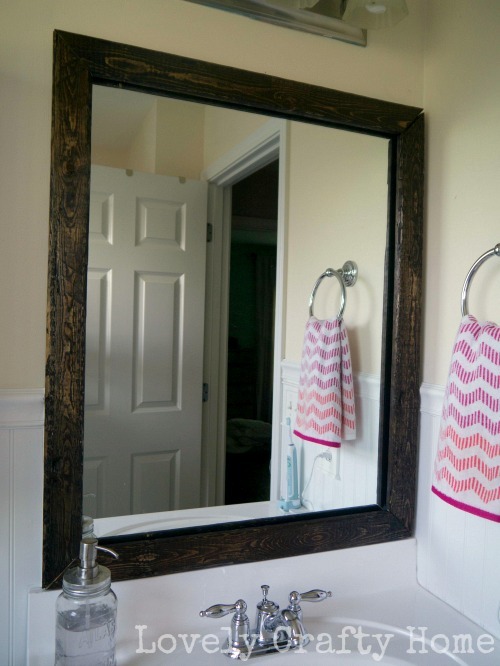 The next day I noticed that I was sneaking a peek at the frame a lot…like more than the amount of times a bathroom really should be frequented. I think I’m diggin’ it so much like this, that I’ll leave it for awhile. Maybe it doesn’t need anymore work. What do you think? I love love love that this is removable. 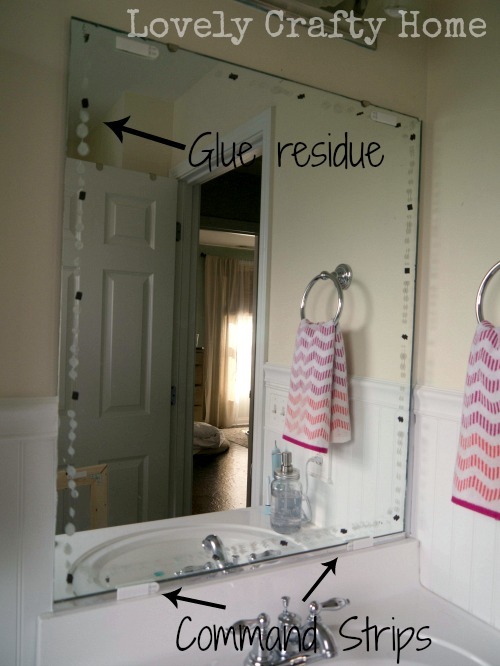 After witnessing the amount of glue residue left on the mirror after the first frame, I doubt I would EVER do that again. 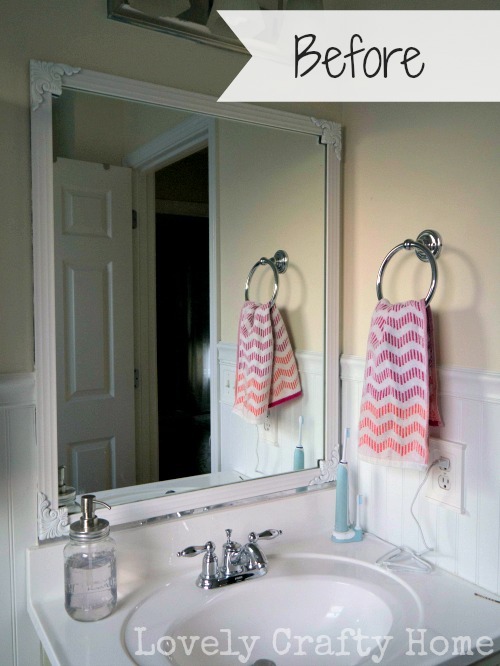 And if you’re renting a place with these boring contractor mirrors, this is a perfect solution for you as well! I’m officially Command-ing everything in my house now (which is kinda funny, because I drive a Jeep Commander…coincidence? I think not). Have you all tried these little pieces of genius yet, or what?? 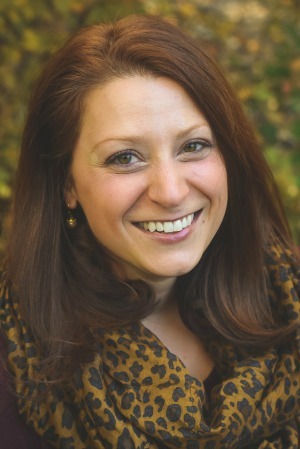 **Pssssttt…you know I always disclose a sponsored opportunity. I have not been paid or perked by 3M/Command for this post – I just freaking love these things. And you should too. If i dont have a single tool, other than a hammer (seriouly lol) do you have any recomendation on how to build the frame? And you said you used velcro to hold the frame onto the mirror, how is it holding up? You can usually have the hardware store cut your lumber, but you would need to do 90 degree corners instead of mitered/angled. Use flat metal plate joiners and nails to attach the pieces together. The velcro has worked great! Still up there!